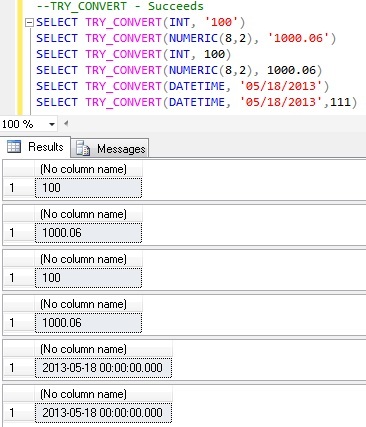 TRY_CONVERT is one of the new built-in conversion function introduced as a Part of Sql Server 2012. TRY_CONVERT function is similar to the CONVERT function, but if CONVERT function fails to convert the value to the requested type then throws an exception where as TRY_CONVERT function returns NULL value. Note: TRY_CONVERT function raises an exception if we try to an convert expression to a type which is not explicitly permitted. data_type : The data type into which to cast expression. expression : The value to be cast. style : Optional integer value that specifies how the TRY_CONVERT function is to translate expression. The Values for this integer parameter are same as the one used by CONVERT function. In the below example we are trying to convert an invalid date i.e. 31st Feburary, 2013. In such cases TRY_CONVERT function will return NULL value instead of throwing exception. In the below example we are trying to convert an integer value to XML type which is not permitted explicitly, in such cases TRY_CONVERT function raises an exception. The conversion of a varchar data type to a datetime data type resulted in an out-of-range value.